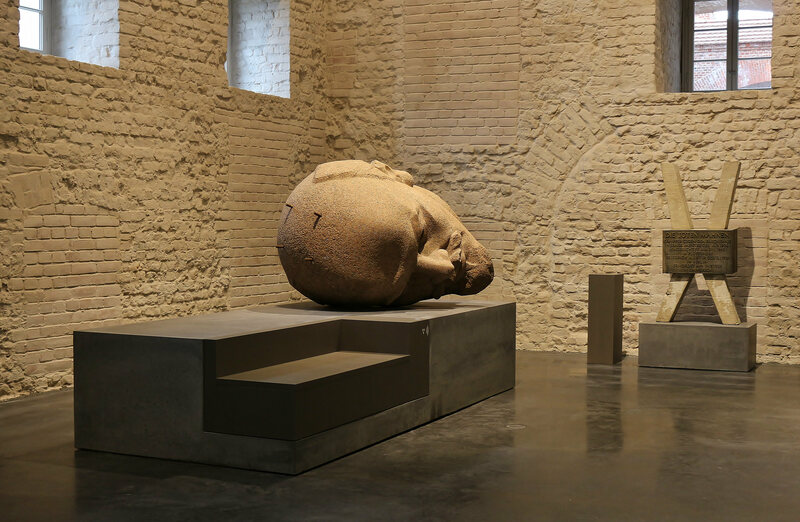 On April 29th 2016 the exhibition „Unveiled – Berlin and its monuments” was solemnly inaugurated at Zitadelle Spandau. 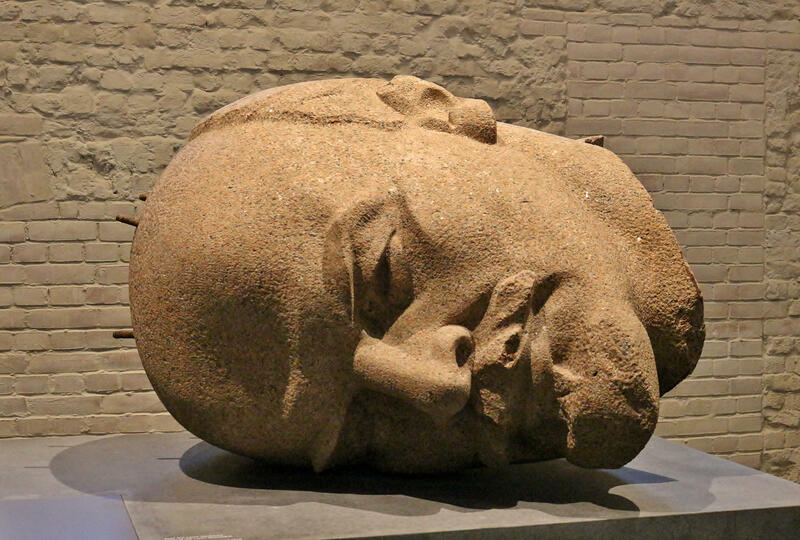 Its main exhibit is a two-meter large head of Lenin with a weight of 3,5 tonnes. 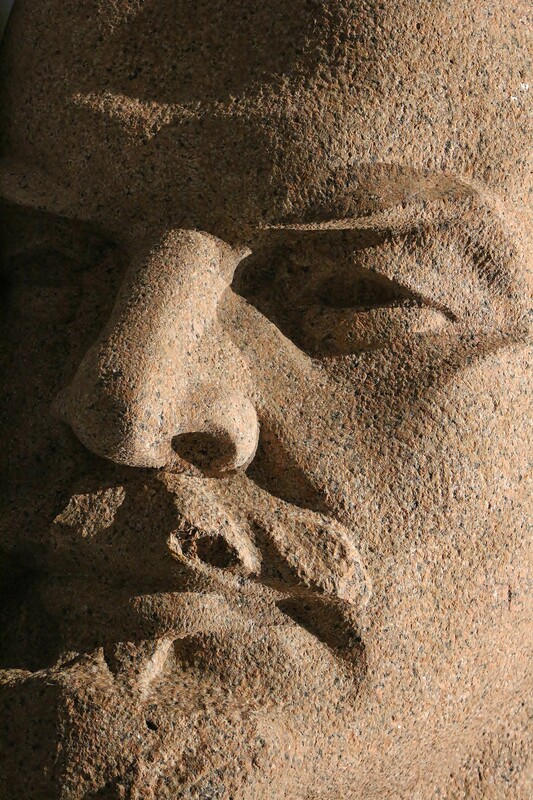 It is made of red granite and used to be part of East Germany’s biggest Lenin-monument. 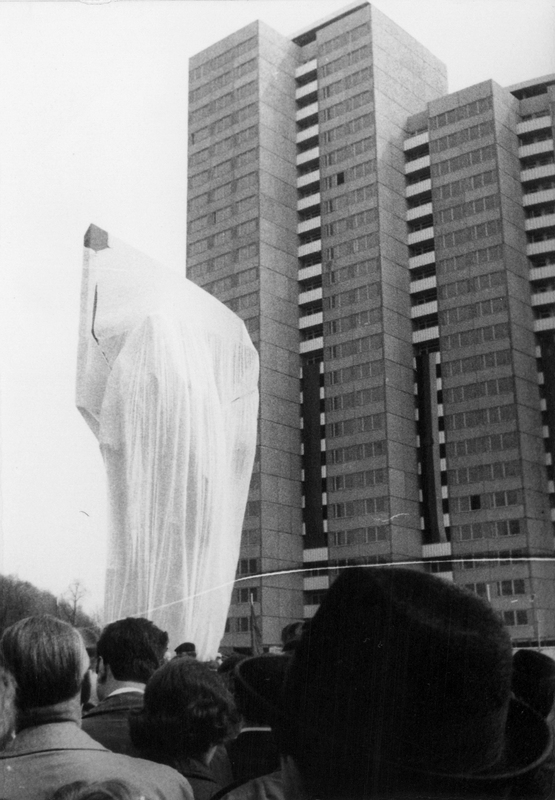 After the reunification, the statue was banished from Berlin, dismantled and buried in a forest nearby. This head was especially dug up for this exhibition and attracted a lot of popular and media attention. The explanation for this high interest was not only the figure of Lenin itself, but especially the amazing history of this monument, which could serve as the script for a Hollywood-movie. 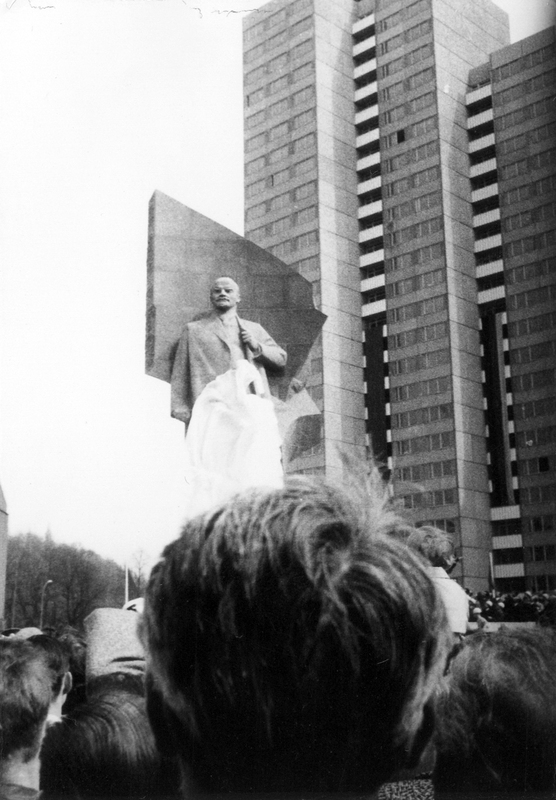 In April 1970, on the occasion of Lenin’s 100th anniversary, East Berlin inaugurated a 19-meter high statue of the Communist hero, made by Nikolai Tomski, one of the Soviet Union’s most renowned sculptors. 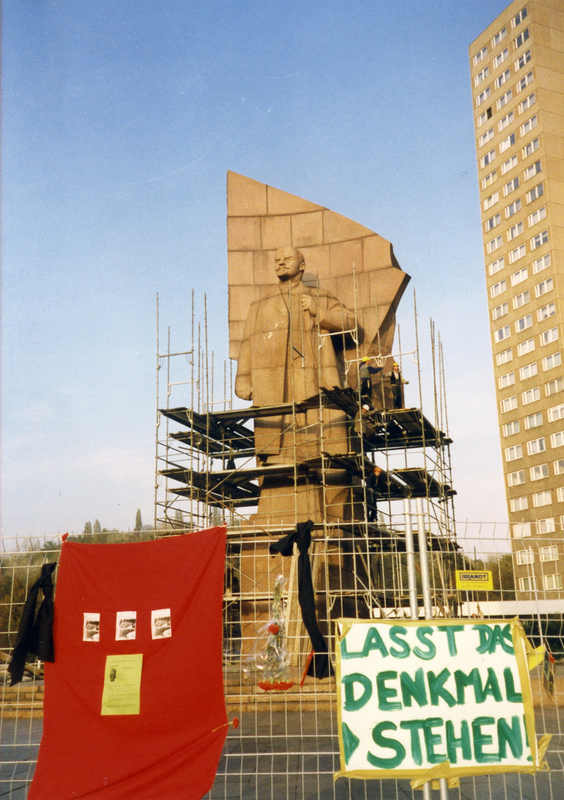 After the collapse of the GDR, the monument was hastily dismantled. As a result of an opaque political process, in order to allow its removal, it was deleted from the official list of protected monuments. 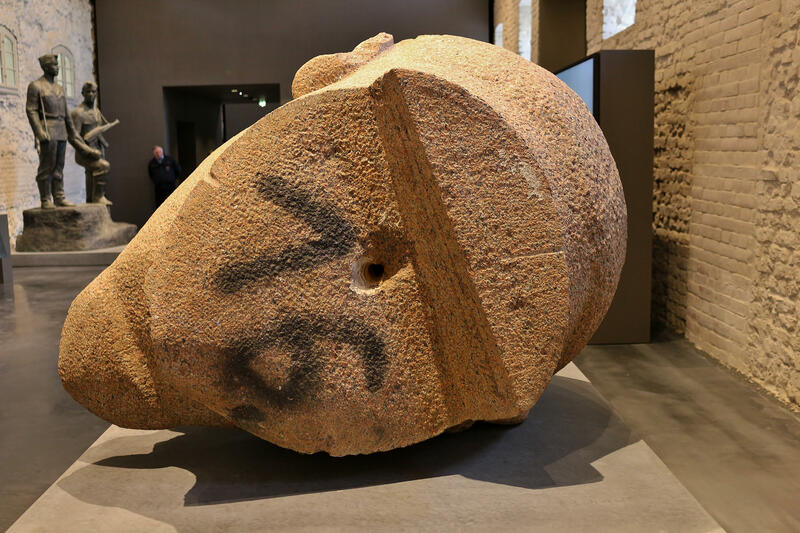 The author’s rights and the protests of historians or groups of citizens were simply ignored and, within a few months, the sculpture was dissected into 129 parts and buried in a sandpit in a forest placed near Berlin. Almost 20 years later the mutilated and apparently forgotten statue suddenly re-emerged under the limelight: Andrea Theissen, the curator of a new permanent exhibition at Zitadelle Spandau about monuments that have been removed from public spaces due to political reasons, planned to include the head of the former Lenin-statue. The idea didn’t precisely arouse enthusiasm among Berlin’s politicians, who in the following years tried everything to avoid the return of the hero of the Red Revolution. The first argument provided by local authorities against the excavation of Lenin’s head was that no one knew its exact location. In facto, however, the research team of the museum had already found out the coordinates and, a few years earlier, even the independent film director Rick Minnich had been able to find the head for his documentary movie “The book of Lenins”. The next problem was the lack of public funds for the project. But since the museum ensured its own private support for the operation, everything seemed to be solved. At this point, the arguments became rather absurd, showing the desperation of local politicians to impede the exhumation of Lenin’s head. 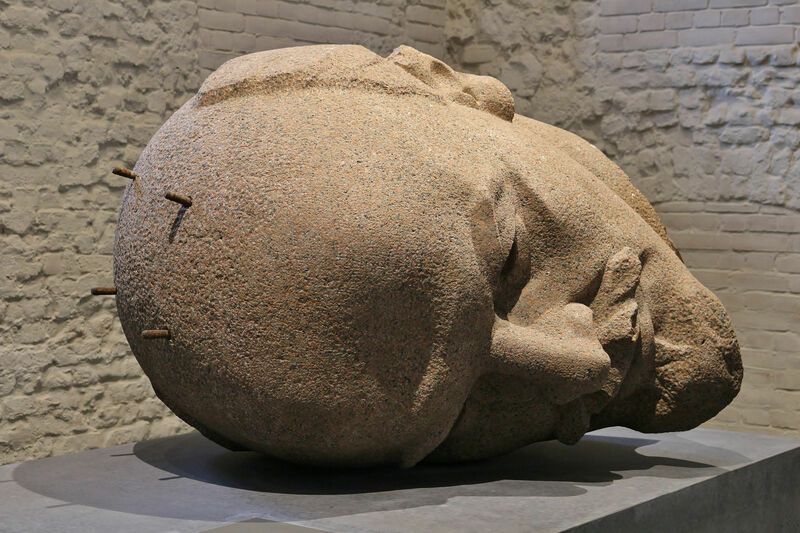 Initially, a report from the Office for the Preservation of Historical Monuments pleaded against the exhibition of the head, noting that the different parts of the complete Lenin-monument should be preserved together – buried 3 meters underneath the earth in the middle of a forest! The critics against this pseudo-scientific reasoning were so strong that the Office finally gave up its surreal line of argumentation. But then suddenly a new obstacle appeared: it seemed that the statue was buried in an area inhabited by a few dozens of rare lizards, so it was not allowed to do any digging there. At the end, the lizards were resettled and Lenin’s head was finally rescued in September 2015. It can now be visited at Zitadelle Spandau in West Berlin. 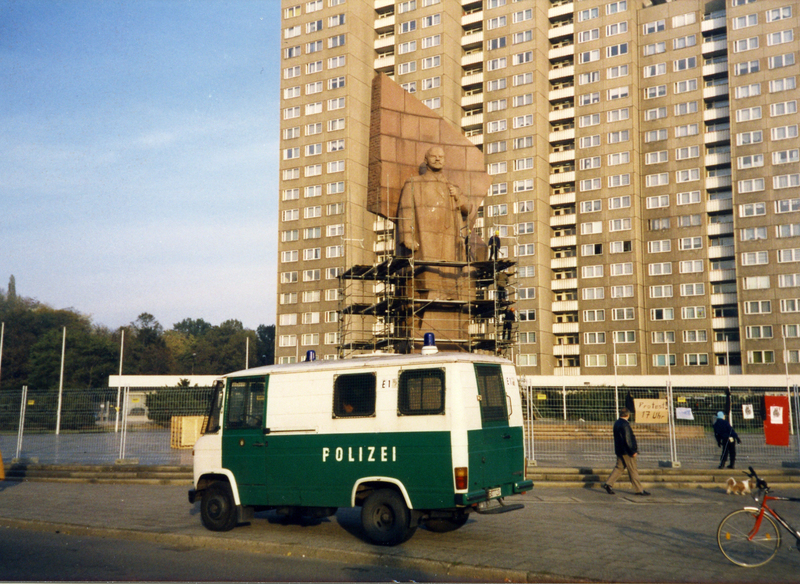 The hurried dismantling of the sculpture, in the early 1990s, and the attempt to hinder the excavation of its head twenty years later, reveal the German authorities’ lacking enlightenment when it comes to monuments of the former GDR. This is particularly visible in regard to Lenin-statues. 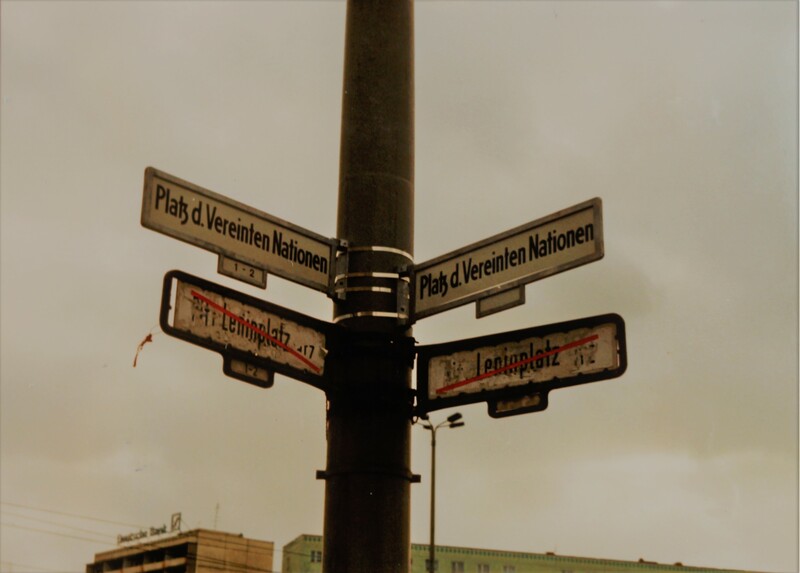 Beyond natural differences on how best to deal with the vestiges of the East German past, we believe that politicians and historians should try to stimulate an honest debate about this issue, instead of hiding themselves behind absurd arguments. We require an open discussion to engage with the heritage of two Germanies. Die abgeschlagenen Köpfe/ der Statuen beweisen nicht das Vergessen. Gelöschte Inschriften/ sind unbesieglich. Diese Verse des Dichters Günter Kunert wurden am Tag der Eröffnung der Ausstellung „Enthüllt – Berlin und seine Denkmäler” in der Zitadelle Spandau vom Historiker Andreas Nachama rezitiert und passen sehr gut zur Geschichte des Hauptexponats: der 2 Meter hohe und 3,5 Tonnen schwere Leninkopf. Aus der Berliner Stadtmitte verbannt und im Wald begraben, erlebte der sowjetische Revolutionär anlässlich dieser Ausstellung ein spektakuläres Comeback, bei dem er in den Medien wie ein Popstar gefeiert wurde. Die Geschichte des Denkmals ist tatsächlich „hollywoodreif“. Am 19. April 1970 wurde in Ost-Berlin ein 19 Meter hohes Standbild des kommunistischen Helden vor tausenden Zuschauern enthüllt. Es war eine Schöpfung von Nikolai Tomski, einem der bekanntesten Bildhauer der UdSSR, und prägte jahrelang das Stadtbild der ostdeutschen Hauptstadt. Nach der politischen Wende wurde die Skulptur aus rotem Granit sofort auf überhastete Weise demontiert. Der Denkmalstatus wurde infolge einer aus rechtlicher Sicht hochumstrittenen Entscheidung aufgehoben, die Urheberrechte der Witwe Tomskis und die Proteste von Bürgerinitiativen oder Kunsthistorikern schlicht ignoriert. Anfang 1992 war das Monument, in 129 Teile zerlegt, in einer Sandgrube im Köpenicker Forst bei Berlin begraben. Fast 20 Jahre später sorgte die verstümmelte und verbuddelte Statue plötzlich wieder für Schlagzeilen: Andrea Theissen, die Kuratorin einer neuen Ausstellung über aus der Öffentlichkeit entfernte Denkmäler, wollte den Kopf des Berliner Leninmonuments als Exponat haben, was bei den Berliner Politikern auf wenig Begeisterung stieß. Es folgte ein langer Kampf der Ausstellungsleiterin gegen die örtlichen Behörden, die mit den verschiedensten Argumenten versucht haben, die Wiederkehr Lenins zu vermeiden. Zuerst hieß es, man könne nicht wissen, wo der Kopf begraben sei. Doch dann stellte sich heraus, dass der genaue Standort sehr wohl bekannt war. Der amerikanische Filmregisseur Rick Minnich hatte den steinernen Leninkopf sogar Jahre zuvor für einen Dokumentarfilm selbst ausbuddelt. Dann wollte man keine öffentlichen Gelder zur Verfügung stellen. Das war kein Problem, denn die Ausstellung hatte eine ausreichende Finanzierung seitens privater Sponsoren, sodass der Bergung des Leninkopfes scheinbar nichts mehr im Weg stand. Doch die Berliner Verwaltung hatte noch einige (eher verzweifelte) Einwände parat, um die Bergung zu verhindern: Die Denkmalschutzbehörde wollte nicht zulassen, dass nur der Kopf ausgestellt werde, da sie den Zusammenhalt des gesamten Denkmals befürworte. Die 129 Einzelteile der Skulptur sollten also unbedingt zusammen aufbewahrt werden – und zwar im Köpenicker Forst, 3 Meter unter der Erde begraben! Als der Druck verschiedener kunsthistorischer Institutionen gegen diese absurde Stellungnahme zu stark wurde, griff man zur Öko-Taktik: Es hieß plötzlich, die Statue befinde sich in einem Gebiet, in dem einige Dutzend Zauneidechsen leben würden, sodass die Ausgrabung aus umwelttechnischen Gründen nicht möglich sei. Am Ende mussten die Eidechsen umgesiedelt werden und im September 2015 konnte der Kopf endlich geborgen werden. Seit dem 29. April 2016 ist er in der Zitadelle Spandau ausgestellt. Sowohl die übereilte Demontage der Statue, als auch der peinliche Versuch, ihre Bergung für eine Ausstellung zu verhindern, zeigen wie sehr es noch an Aufgeklärtheit fehlt, wenn es um Monumente aus der DDR-Zeit und konkret um Lenindenkmäler geht. Unabhängig von den verschiedenen Meinungen, die man vertreten kann, sollten Politiker und Historiker keine Angst vor einer offenen und aufrichtigen Debatte haben, denn nur sie kann zu einem adäquaten Umgang mit der deutsch-deutschen Vergangenheit und deren Zeugnissen führen.